*NOTE: Features vary by application. See description for specific details. FITMENT NOTE: 2011-2014 GM LML 6.6L trucks must have the latest ECU calibration prior to use of Banks AutoMind. Wrap Your Hand Around Some Serious Power! Introducing the latest in pre-loaded, pre-programmed power from the most trusted name in engineered engine efficiency. Banks is the only record-holding engine builder in the programming game, and now that expertise can be yours! The Banks AutoMind programmer comes ready to run with pre-loaded power right out of the box and right for the job at hand! 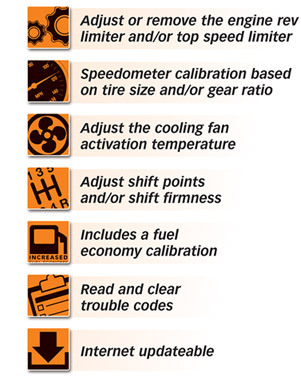 Its calibrations were developed with power and increased MPG in mind. The AutoMind can also display a host of critical engine functions and provides service technician diagnostic capabilities with its ability to scan and clear vehicle trouble codes. Intense, usable, real horsepower only from Banks!